Flooding is the most frequent and expensive natural disaster in the U.S., according to the Federal Emergency Management Agency (FEMA). Floods cost our nation nearly $8.2 billion annually. Yet, a 2016 Insurance Information Institute poll found that only 12 percent of U.S. homeowners have flood insurance. The National Association of Insurance Commissioners (NAIC) offers this information to help you better understand flood insurance, your risk and what to do in the event of a flood. The most important thing to understand about flood insurance is what it isn't. The flood peril is not typically covered through most homeowners and renter's insurance policies. Flood insurance is a separate coverage you can purchase through an agent or insurer participating in the National Flood Insurance Program (NFIP), which FEMA manages. The NFIP provides coverage of up to $250,000 for the structure of a home and up to $100,000 for personal possessions. 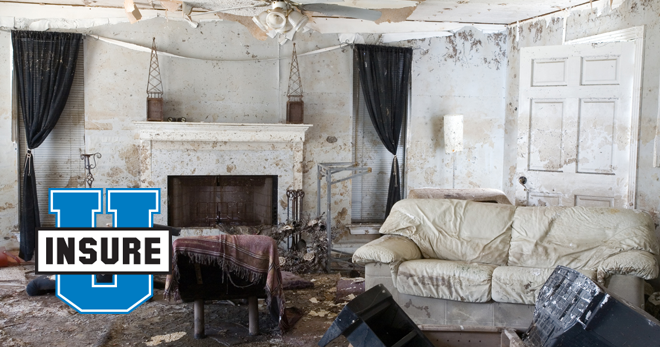 If your agent or insurer doesn't sell flood coverage, contact the NFIP Referral Call Center at 1-800-427-4661. If your community doesn't participate in the NFIP, contact your licensed insurance agent to ask about private flood insurance. If your agent can't write a private flood policy, he or she may refer you to another licensed agent. If you choose a private flood insurance policy, shop around and compare coverage and premiums before you decide which policy to buy (NAIC Flood Insurance Basics – PDF). It is important to note that the NFIP insurance policy doesn't go into effect immediately after you buy it. NFIP policies have a 30-day waiting period unless a policy is bought at the same time as a newly purchased home. High-risk areas have at least a 1 percent chance of flooding each year. Homeowners in these areas with mortgages from federally regulated or insured lenders are required to buy flood insurance. Moderate- to low-risk areas have less than a 1 percent chance of flooding each year, but there is still a possibility the area could flood. Flood coverage isn't required in these areas, but it is recommended. Some mortgage lenders still require you to have flood insurance in non-high-risk areas. Undetermined risk areas are areas where flood-hazard analysis has yet to be conducted, but risk still exists. It is important to note that approximately 20 percent of flood insurance claims come from outside of high-risk flood zones. Where it can rain, it can flood. According to FEMA, an inch of water in a home could cause more than $25,000 in damages. If you experience flooding and have not purchased flood insurance, you might experience financial ruin. Contact your insurance provider to learn more about flood insurance, to learn if your community participates in the NFIP or to get a quote. Have a plan. Learn the evacuation routes in your community and designate a point of contact in another state in the event your family is separated. If you are staying in your home during a flood event, go to the highest level of your home. If you are outdoors, move to higher ground and take shelter, if necessary. Keep insurance agent and company contact information handy. In the event of a flood, make contact with your insurer as soon as possible when it's safe. Your policy may require you to notify the company within a certain time frame. File a claim. Most insurance companies have a time requirement for reporting a claim, so contact your agent or company as soon as possible. Your state insurance department can help you find contact information for your company, if you cannot find it. Beware of fraud. Protect yourself by getting more than one bid from contractors and requesting references. Ask for proof of necessary licenses, building permits, insurance and bonding. Record the contractor's license plate and driver's license numbers and check for complaints with the Better Business Bureau (BBB). You can learn more about disaster preparedness at Insure U, the NAIC's consumer education website. ©2018 National Association of Insurance Commissioners. All rights reserved.